Notes The Four Bursteins: Pesach Burstein, Lillian Lux, and their twins Michael and Susan perform in this delightful comedy about a wedding. 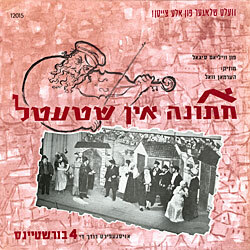 Accompanied by chorus and orchestra they tell the story of Yossele and Feigele, betrothed since childhood. Sounds simple? Don't be fooled. This hilariously melodramatic, complicated story takes so many twists and turns that it could make your head spin. But don't worry! Everything works out in the end.